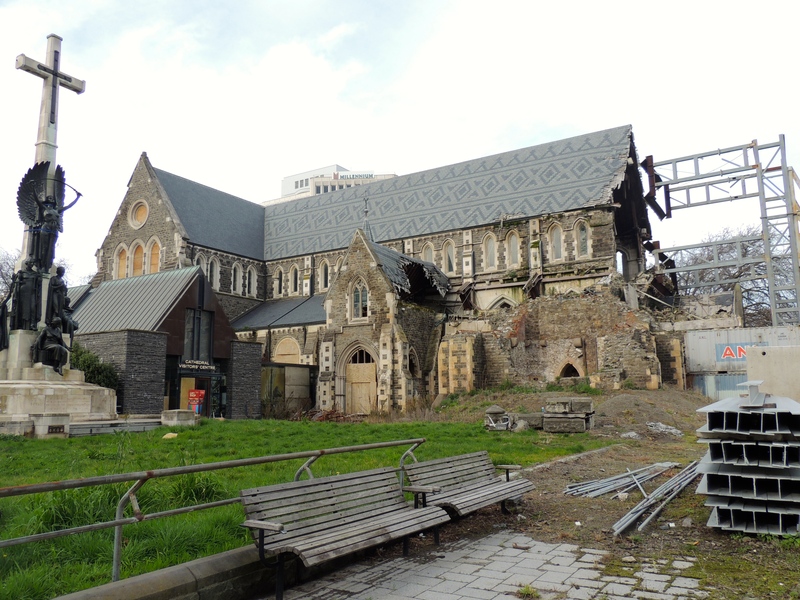 Christchurch: The Redemption – These Two Eyes! While the weather didn’t redeem itself on my recent trip to Christchurch, the city itself did once night turned to day. 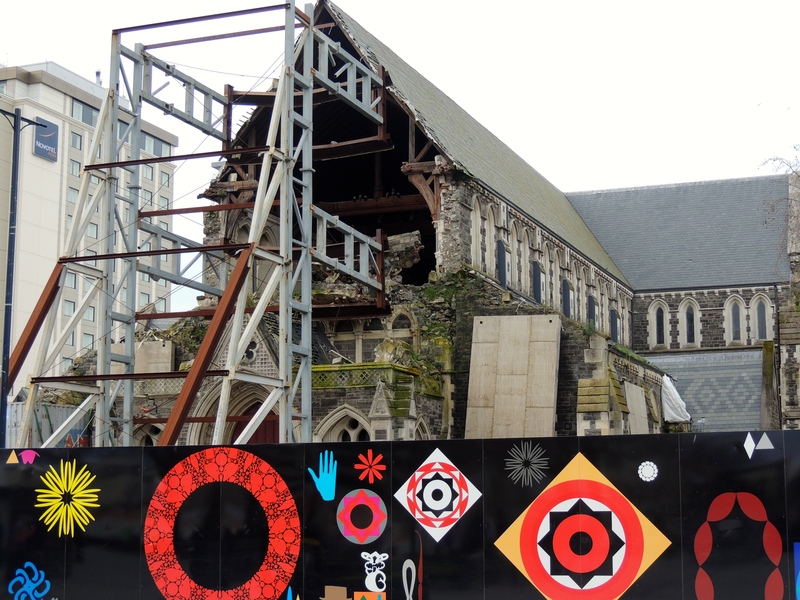 I first revisited the heavily damaged Christchurch Cathedral to take a closer look, which only created an even more eerie feeling once the level of destruction was more prominent. This motivated me to take in as much of the city as I could, and find the ‘stuff’ that wasn’t damaged. I strolled a short walk to the Re-Start Project – stores housed in brightly colored shipping containers, from local handmade craft wares to mega brand Katmandu. It was enough browsing to keep me busy for an hour or so. Amongst the ‘shopping containers’ and continuous construction are food trucks and coffee shops, making it the closest option to a mini market square. I heard a rumor they may even keep it that way once the city gets back on its feet. It’s here you’ll also find Quake City, inappropriately deemed Christchurch’s Earthquake Attraction to demonstrate to tourists the reality of the 2011 earthquake. 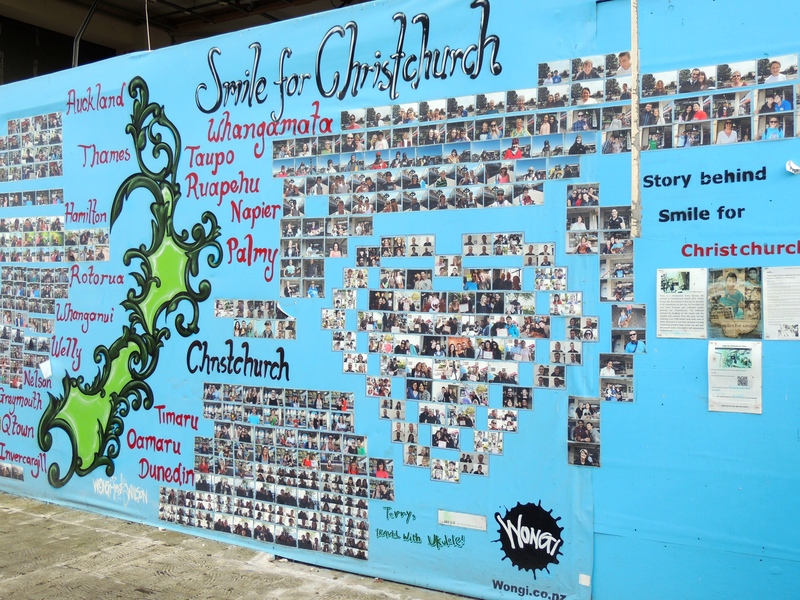 More heartfelt was Taiwanese backpacker Terry’s Smile for Christchurch campaign, a collection of smiles from around the world taken to brighten the city of Christchurch. 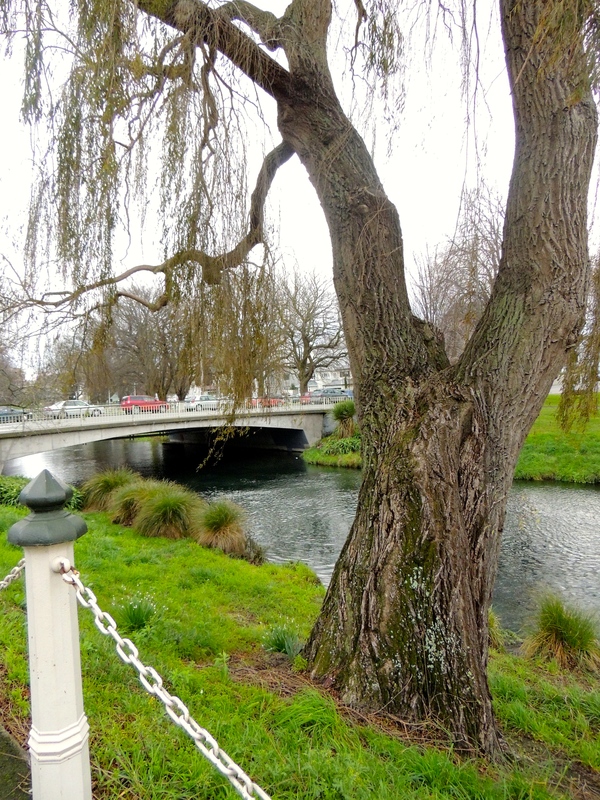 It’s only a short walk to the Avon River, then to the greens of Hagley Park and the Botanical Gardens, which apparently are even a sight in this desperate winter. For the true tourists, you can even punt along the Avon, pole to the river floor. I followed the city east and discovered a few more Scape Public Art exhibits; refreshing attempts to get the locals involved and rejuvenate the city culturally. The murals covering the side of massive brick buildings are a revitalizing contrast against vacant lots, concrete rumble and abandoned Caterpillars. And finally and with much gratitude I found Cassell & Sons CBD Bar. I was told you could get a sampler of either 4 or 6 of the Christchurch brew. I opted for the four, I was on working hours after all, but what I received was not the same thing as the tasting paddles I’m used to. Instead what I got was basically 4 pot sized (small beer) of the milk stout, dunkel, lager and IPA. 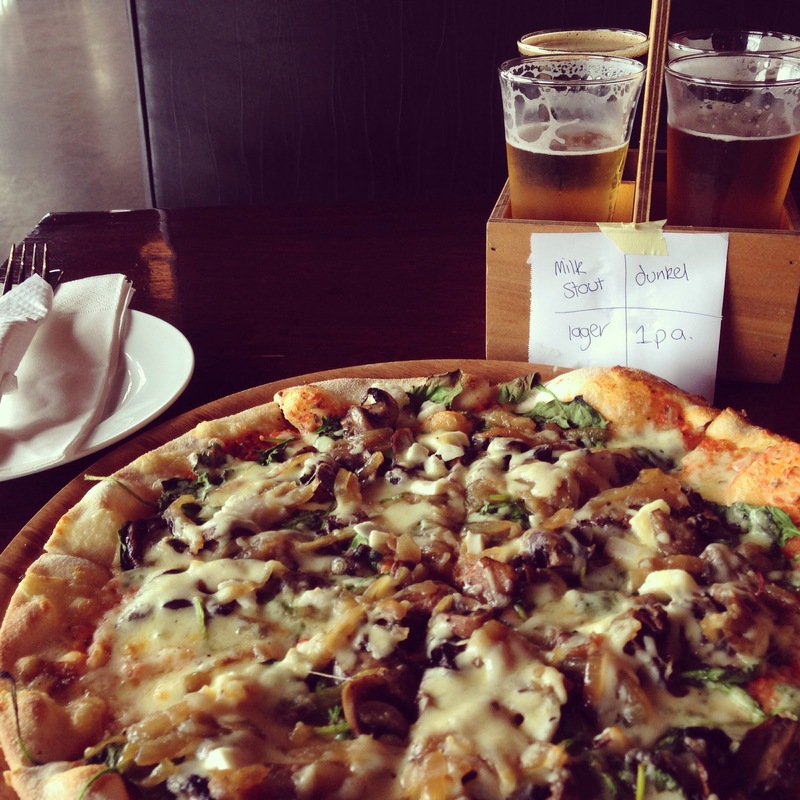 While listening to the funky tunes being played in the background I nonchalantly tried to pretend that the massive ‘personal’ pizza and 4 beers were being shared with someone and that my table for one was a façade. After polishing off the milk stout and dunkel – the best of the four, I rushed out of there to make my flight to Queenstown via Christchurch airport . So this is the most interesting part. In Australia, I’m used to by now not having to show any identification for domestic flights. New Zealand, takes it up one more notch – no security screening for domestic flights. Speechless.